Today I am thrilled to introduce Recipe Giftbook, a collaboration with family and friends to create the perfect wedding gift, a unique recipe book to treasure forever. 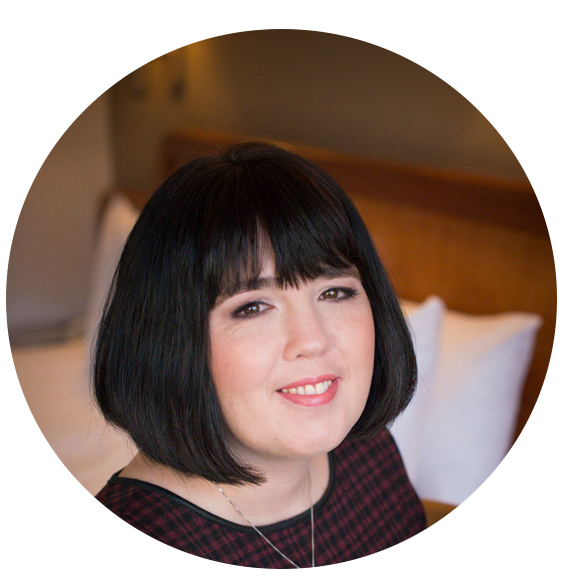 I am Corrie and I live in beautiful Mid-Wales with my husband and 2 year old daughter, I love being creative and have a passion for food and recipes. I am also the founder of recipegiftbook.com which is an alternative wedding gift list website for couples looking to create one truly unique and personal gift to celebrate their wedding day. The bride and groom can invite their friends and family to collaborate to create a recipe book to treasure forever and pass down to future generations. Guests add recipes, photos and a personal message online and the bride and groom receive a complimentary hardback recipe book full of special shared recipes following their wedding day. The idea had been in my head since I got married in 2010. We were mindful about the drain on the planet’s resources of unnecessary gifts and didn’t feel comfortable giving friends and relatives with a variety of budgets a list of consumer goods. In the end we said ‘no gifts’ but due to our guests generosity we were showered with numerous gifts anyway! It made me think afterwards that if only we could have channeled their energies into something….. Even I am guilty of giving gifts/money when I have been to weddings that say ‘no gifts’, its such a long standing tradition to give the bride and groom something to celebrate their wedding day, it just doesn’t feel right going empty handed! The current trend of giving personalised gifts made me think about what would be really personal to me? I thought about how I love recipes and how unique they are, how people have special family recipes that go back generations and how nice it would be to collect them into one book. I also realised when I was setting up the website that a bride planning her wedding would not have time to start collecting loads of recipes! so I knew it needed to be a really simple process. 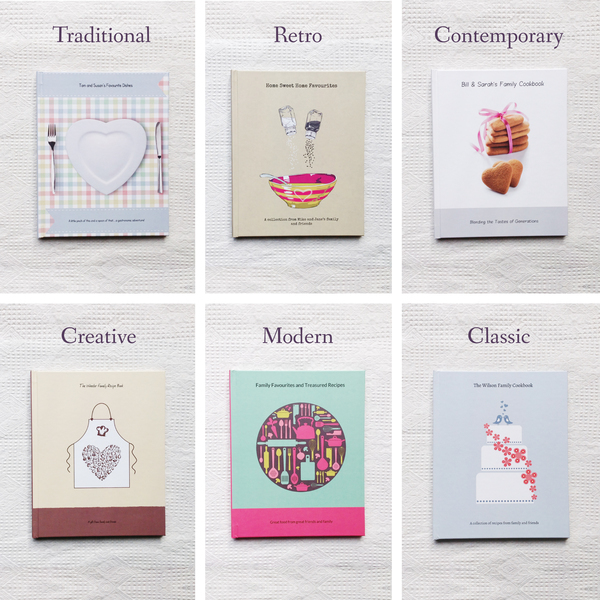 I set up the website in 2014 with the aim to create a really effortless process where all the bride and groom had to do was register, select from a choice of 6 beautiful recipe book designs (Traditional, Classic, Modern, Retro, Contemporary and Creative) choose their recipe book title and then leave their friends and family to do the rest. The bride and groom receive a unique ‘guest code’ which they can include with their own wedding invitations with an explanation to their guests that they have chosen to register with recipegiftbook.com or they can order our complimentary ‘insert cards’ which they can put in with their invitations. It doesn’t cost the bride and groom a penny and provides guests with the opportunity to give a really personal gift, in return for a small contribution to the production costs. 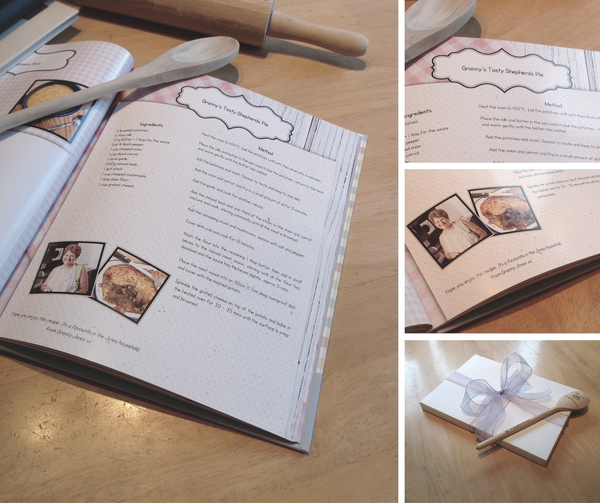 Once complete we send the bride and groom their complimentary hardback recipe book, beautifully wrapped in a gift box. 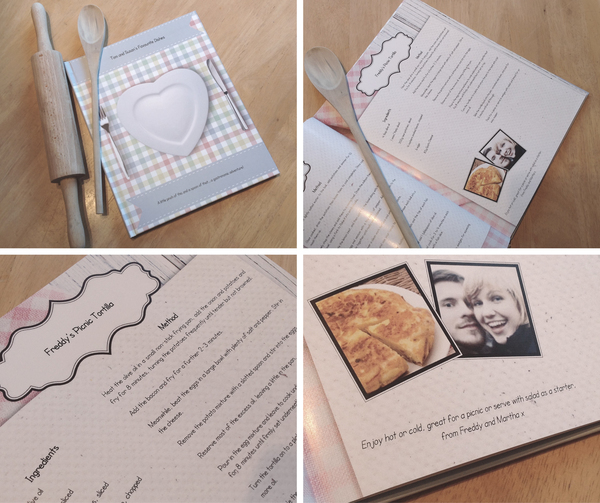 Helping couples to create something I know they will really cherish, their recipe book becomes an heirloom, something to cherish and hand down to their children. The current trend for vintage ideas and personalised gifts helps Recipe Giftbook stand out at a time where people are looking for something individual. Especially when it comes to weddings where most brides are searching for ideas to make their day unique and special. 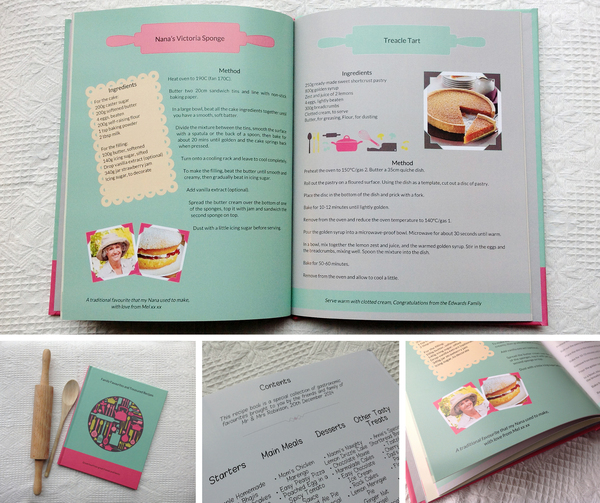 The recipe book is hardback which in this current digital world may seem to go against the trend but we have found our couples love to have something tactile something they can embrace and value. On a personal level it was reaching a stage where I could give up my day job (in the renewables and environment industry) and work on my own business full time. I probably work harder but I enjoy every minute and I have loved joining the wedding industry. It feels like such a happy industry to work in! Surrounded by glorious products (cakes, flowers, confetti, dresses) and professionals (photographers, entertainers, wedding planners, bloggers) as well as the brides and grooms all working merrily towards their big day. I would love to continue to grow the business in the UK and then consider providing the service in other countries. • I would like an additional copy, can I buy another? Yes, once the book is finished we will send the bride and groom an email with a unique link to buy additional copies. They can also share the link with their friends and family if they want to allow them to purchase a copy. • What if one of my guests can’t get on the internet to add a recipe? Its simple, just download the printable form (on the FAQ page) and send it to them. They can fill in their recipe details and the bride and groom can add the recipe online for them. Alternatively they can ring our customer services number and speak to one of our helpful staff who can add the recipe online for them and take payment over the phone. 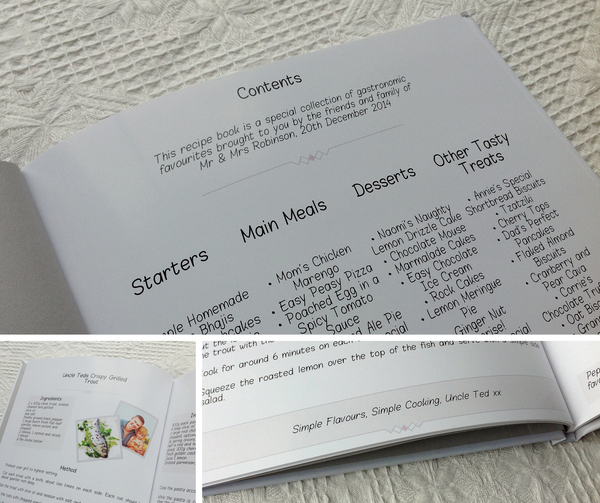 • Can the bride and groom add recipes too? Yes, the bride and groom can add 3 recipes of their own free of charge. • We are setting up home; can our guests buy us vouchers? Yes, when you set up registration just click the option to allow your guests to buy you vouchers. They will be posted to you along with your completed recipe book. The following stores vouchers are offered: John Lewis, M&S, Debenhams, Next, BHS, House of Fraser, Selfridges, Laura Ashley, Argos, Thomas Cook, B&Q, Homebase. Thank you so much to Corrie for sharing her truly unique wedding gift. Such a special way to feel the love of your family and friends long after the I do’s have been said. From brand new culinary delicacies to recipes passed down through generations what a wonderful and cost effective idea that guests will love.